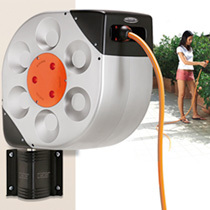 The Rotoroll® is a cleverly designed automatic hose reel which can be pulled out to any length, delivering water equally well whether it is fully out or fully retracted. And there's no need to wind it back up - the special free-running hose and internal winding mechanism provide faultless recoil every time (with safety guaranteed by a "Soft Block" device that locks the reel instantly in the event of the hose being dropped accidentally). The wall bracket pivots through 180° and the hose reel's outer casing is guaranteed shock-proof, weather-resistant and UV-stable. Complete with 20m (66') of non-kink, anti-friction hose. 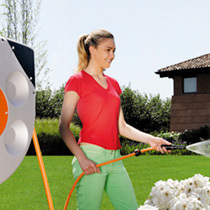 2m (6'6") extension hose to link to your outside tap, 1.8cm (¾") tap connector, quick-click automatic fittings and a spray lance. An end to tangled hose pipes!